Kevin Spacey as President Frank Underwood in “Chapter 34” of House of Cards (2015). According to the Netflix version of House of Cards, today – September 7, 2015 – would have found the American eastern seaboard in trouble as Hurricane Faith rumbled on its way. Luckily for dwellers in both the show’s universe and the real universe, the Category 4 hurricane ended up offering no real threat… leaving President Underwood in the frustration position of having provided emergency funding when it wasn’t needed. While this wouldn’t necessarily mean trouble for a politician, it meant the end of Frank’s “AmericaWorks” pet project and thus the beginning of his 2016 presidential run. 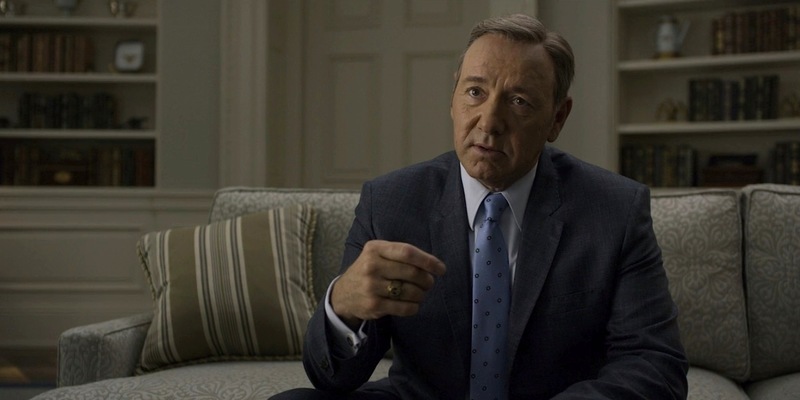 Although Kate Baldwin’s dual narrative is a bit heavy-handed in comparing the devastation of Hurricane Faith with “Hurricane Frank”, Chapter 34 serves as a necessary catalyst to give Frank Underwood a valid reason to run for President in 2016 – as we all knew he would. Plus, it brings back Freddy Hayes, and Reg E. Cathey’s low-key scene dominance is always welcome on screen. Always impeccably dressed – perhaps to make up for his behavior – Frank spends much of “Chapter 34” wearing a dark blue linen suit that nicely transfers his favorite color into a suiting appropriate for the warm D.C. climate. President Underwood keeps his linen suit looking professional. Frank’s suit jacket is single-breasted with slim notch lapels that roll down to a two-button front at mid-torso. The suit jacket pulls a little when buttoned, perhaps a reference to Frank’s inferred weight gain since becoming President and, thus, relatively complacent as leader of the free world. The jacket’s shoulders are slightly padded to give Frank the stronger profile he needs to intimidate others. The welted breast pocket is left empty, and the flapped hip pockets sit straight around his waist on the same axis as the lower button. The long double rear vents make it easier for Frank to push his jacket aside when placing his hands in his trouser pockets. Even with an old friend, Frank doesn’t let his guard down. Little is seen of the trousers themselves, but they have a flat front and plain-hemmed bottoms. Frank wears them with a black leather belt with a small, polished steel single-claw buckle. Frank goes for a monochromatic ensemble by also wearing a blue shirt and tie, with the lightness of the shirt providing a healthy contrast against the darker suit. His pale blue poplin shirt has a large collar with a moderate spread. The white buttons fasten down a plain, placket-less front, and the French cuffs are secured with a set of silver links emblazoned with the Presidential Seal. 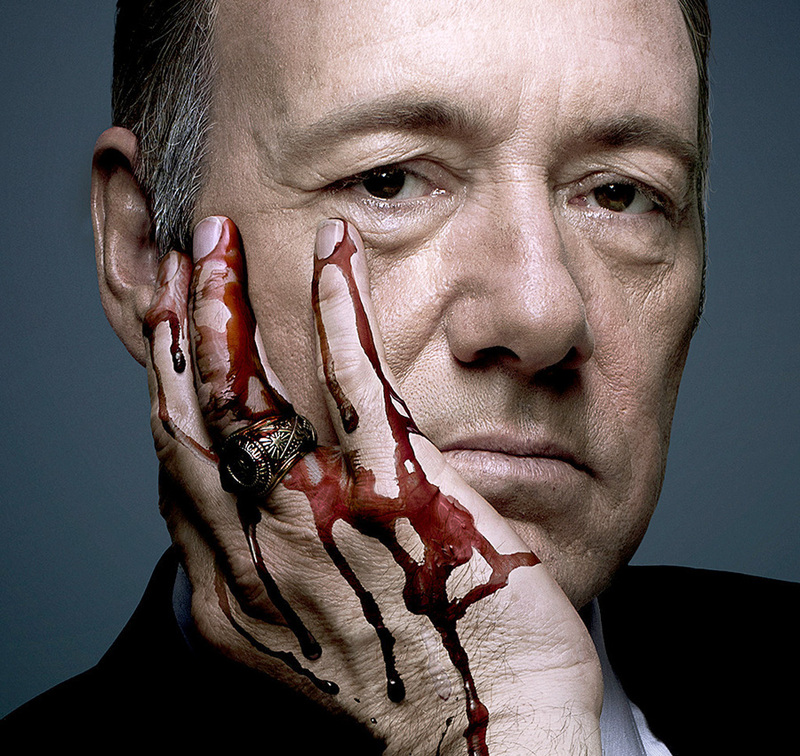 Even in repose, Underwood keeps his tie perfectly knotted at the neck. 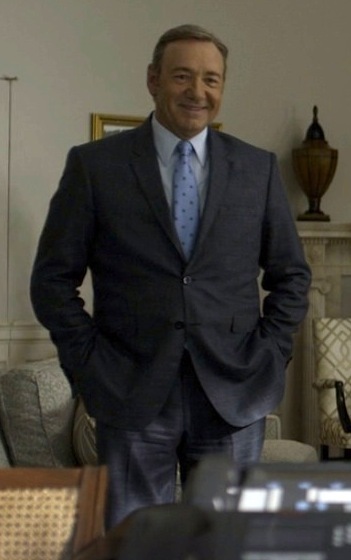 President Underwood’s woven silk tie has a cornflower blue ground with a faint white grid that connects a pattern of plain white dots and darker navy blue floral accents. 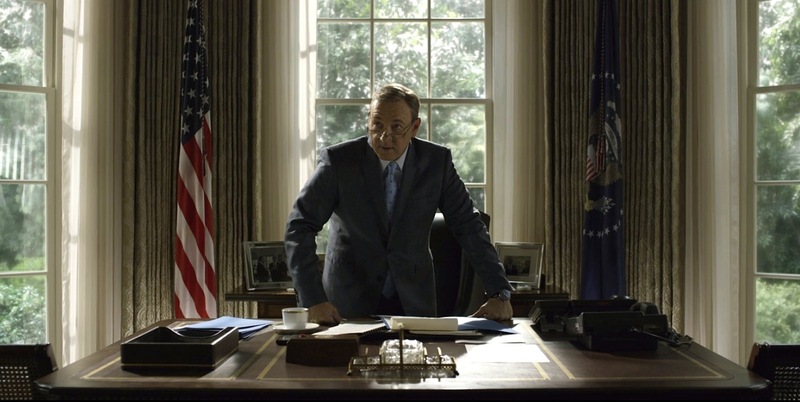 Frank Underwood, looking fresh for a day of political glad-handing… then a little worse for wear after the day is done. Frank wears the familiar pair of black leather plain-toe oxfords, laced through five eyelets, that he tends to wear with his suits. His socks are dark, likely black but possibly blue. The monochromatic scheme even extends to his wristwatch. Noted IWC ambassador Spacey wears a stainless IWC automatic with a blue dial and black leather strap, which I believe is an IWC Portofino Automatic. 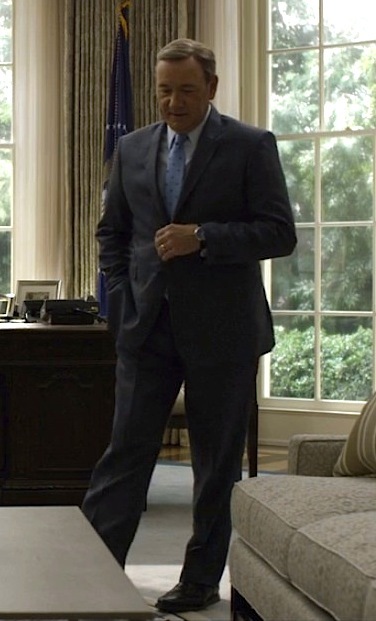 Although Underwood notably wore IWC watches throughout the first two seasons, this dialed watch didn’t make its first appearance until the third season premiere. Many have identified it as the IWC Portuguese Yacht Club Chronograph Automatic IW390213, but that watch has Arabic numerals and two sub-dials while the watch on the show has Roman numerals and appears to have no sub-dials. Still, if you’re a fan of the Yacht Club watch and you’ve got $12,240 that you’d like to invest in one, Jomashop.com has them for sale. If the price has you worried, fret no more – shipping is free! Frank wears a gold ring on the 3rd finger of each hand: his class ring on his right hand and his white gold wedding band on his left hand. His class ring from “The Sentinel” is based on the heavy 10-karat yellow gold ring worn by graduates of The Citadel, a military college in South Carolina. It appears to share a similar design and lack of gemstone with The Citadel ring, and in the episode where he buries it – “Chapter 18” – we see the year 1981 inscribed on it. Frank negotiates jobs with Freddy. Since Frank had buried the ring, his wife Claire gives him a new one that she had made as a pre-birthday gift upon his taking the office of President in “Chapter 26”. Frank also wears a pair of simple steel-framed reading glasses that he removes when Freddy and DeShawn enter the Oval Office. Frank adopts a very presidential pose when greeting his old pal Freddy. Underneath his dress shirt, Frank wears a white cotton crew neck short-sleeve t-shirt that serves as an undershirt. When flying on Air Force One, Underwood dons a blue nylon zip-front flight jacket with the Presidential seal on the left breast. Although there’s no denying the stylish practicality of linen suits in warm weather, it’s often difficult to incorporate them into the professional world. 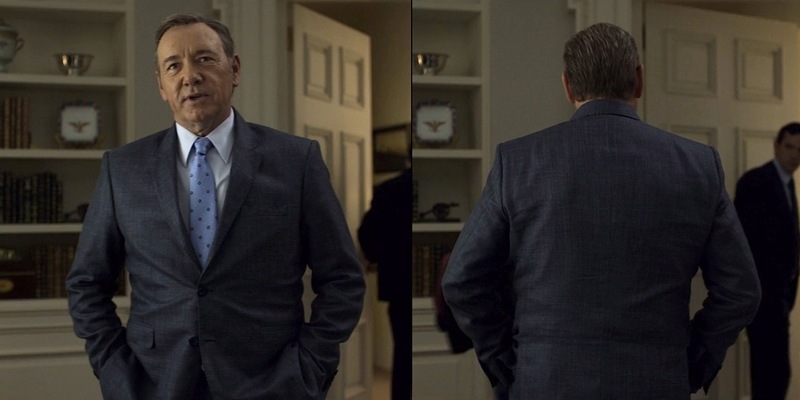 Frank Underwood finds a way to put a professional and presidential stamp on a linen business suit. 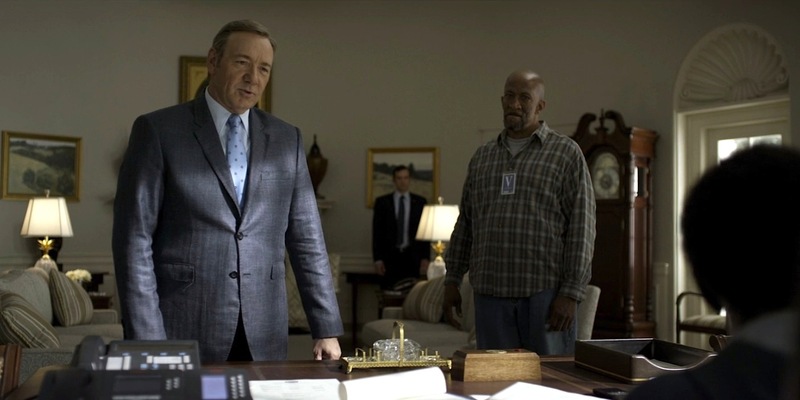 When aboard Air Force One for a casual meeting, Frank loses the coat and tie and dons a blue nylon Presidential flight jacket. Check the show out on Netflix, as it set the new standard for binge-watching. If you’re a traditionalist, you can also pick up the first , second , and third seasons on DVD. How could they mistake his watch for a Yacht Club? Amateurs! It’s definitely a Portofino. I consider it a great achievement to have you confirm my watch hypothesis! Like having Keith Richards tell me I played a great lick.